I have a UICollectionView with a FLowLayout. It will work as I expect most of the time, but every now and then one of the cells does not wrap properly. For example, the the cell that should be on in the first "column" of the third row if actually trailing in the second row and there is just an empty space where it should be (see diagram below). All you can see of this rouge cell is the left hand side (the rest is cut off) and the place it should be is empty. This does not happen consistently; it is not always the same row. Once it has happened, I can scroll up and then back and the cell will have fixed itself. Or, when I press the cell (which takes me to the next view via a push) and then pop back, I will see the cell in the incorrect position and then it will jump to the correct position. The scroll speed seems to make it easier to reproduce the problem. When I scroll slowly, I can still see the cell in the wrong position every now and then, but then it will jump to the correct position straight away. The problem started when I added the sections insets. Previously, I had the cells almost flush against the collection bounds (little, or no insets) and I did not notice the problem. But this meant the right and left of the collection view was empty. Ie, could not scroll. Also, the scroll bar was not flush to the right. I can make the problem happen on both Simulator and on an iPad 3. I guess the problem is happening because of the left and right section insets... But if the value is wrong, then I would expect the behavior to be consistent. I wonder if this might be a bug with Apple? Or perhaps this is due to a build up of the insets or something similar. Follow up: I have been using this answer below by Nick for over 2 years now without a problem (in case people are wondering if there are any holes in that answer - I have not found any yet). Well done Nick. This might be a little late but make sure you are setting your attributes in prepare() if possible. My issue was that the cells were laying out, then getting update in layoutAttributesForElements. This resulted in a flicker effect when new cells came into view. this completely made the CollectionViewCell disappear... Any other possible solution? I've just encountered a similar issue with cells disappearing after UICollectionView scroll on iOS 10 (got no problems on iOS 6-9). Subclassing of UICollectionViewFlowLayout and overriding method layoutAttributesForElementsInRect: doesn't work in my case. The solution was simple enough. Currently I use an instance of UICollectionViewFlowLayout and set both itemSize and estimatedItemSize (I didn't use estimatedItemSize before) and set it to some non-zero size. Actual size is calculating in collectionView:layout:sizeForItemAtIndexPath: method. Also, I've removed a call of invalidateLayout method from layoutSubviews in order to avoid unnecessary reloads. where did set the itemsize and estimatedItemsize in the uicollectionviewflowlayout? There is a bug in UICollectionViewFlowLayout's implementation of layoutAttributesForElementsInRect that causes it to return TWO attribute objects for a single cell in certain cases involving section insets. One of the returned attribute objects is invalid (outside the bounds of the collection view) and the other is valid. Below is a subclass of UICollectionViewFlowLayout that fixes the problem by excluding cells outside of the collection view's bounds. Other answers suggest returning YES from shouldInvalidateLayoutForBoundsChange, but this causes unnecessary recomputations and doesn't even completely solve the problem. My solution completely solves the bug and shouldn't cause any problems when Apple fixes the root cause. FYI this bug also crops up with horizontal scrolling. Replacing x with y and width with height makes this patch work. Thanks Patrick and Yanik. I updated my answer to support vertical scrolling as well. I stumbled upon this page a year ago and this solved my problem. Thanks! However, I was wondering whether this problem has been fixed internally by Apple. Cheers. @richarddas No, you don't want to check if the rects intersect. In fact, all of the cells (valid or invalid) will intersect the bounds rect of the collection view. You want to check if any part of the rect falls outside the bounds, which is what my code does. @Rpranata As of iOS 7.1, this bug has not been fixed. Sigh. @NickSnyder Nick I'm facing the same issue after using collection view inside table view cell.The cells inside the internal collection view are rearranged and sometimes disappearing.Please help me how i am supposed to user your code.I am just setting your custom layout instead of UICollectionview layout.But - (NSArray *)layoutAttributesForElementsInRect:(CGRect)rect where to use this method? Maybe I'm using this wrong, but on iOS 8.3 in Swift, this is causing subviews on the right that used to be cut off to not appear at all. Anyone else? Have they not fixed this 3 years later? to refresh and it can show all cells correctly, you can try it. My issue was that the cells disappeared completely. This solution helped - however this causes unnecessary reloads. Still it is working now.. thx! As noted by DHennessy13, this current solution is good but may be imperfect as it will invalidateLayout when rotating the screen (and for most cases it shouldn't). An improvement could be to set a flag in order to invalidateLayout only once. I just experienced a similar issue but found a very different solution. I am using a custom implementation of UICollectionViewFlowLayout with a horizontal scroll. I am also creating custom frame locations for each cell. The problem that I was having was that [super layoutAttributesForElementsInRect:rect] wasn't actually returning all of the UICollectionViewLayoutAttributes that should be displayed on screen. On calls to [self.collectionView reloadData] some of the cells would suddenly be set to hidden. What I ended up doing was to create a NSMutableDictionary that cached all of the UICollectionViewLayoutAttributes that I have seen so far and then include any items that I know should be displayed. // We have to do this because there is a bug in the collection view where it won't correctly return all of the on screen cells. Here is the category for NSMutableDictionary that the UICollectionViewLayoutAttributes are being saved correctly. I'm using horizontal scrolling too, I manage to fix the issue using your solution, but after performing segue to other view and came back, the content size seemed to be wrong when there are extra items which doesn't divide into columns equally. I found a solution to fix issue where cell getting hidden after performing segue and back to collection view. 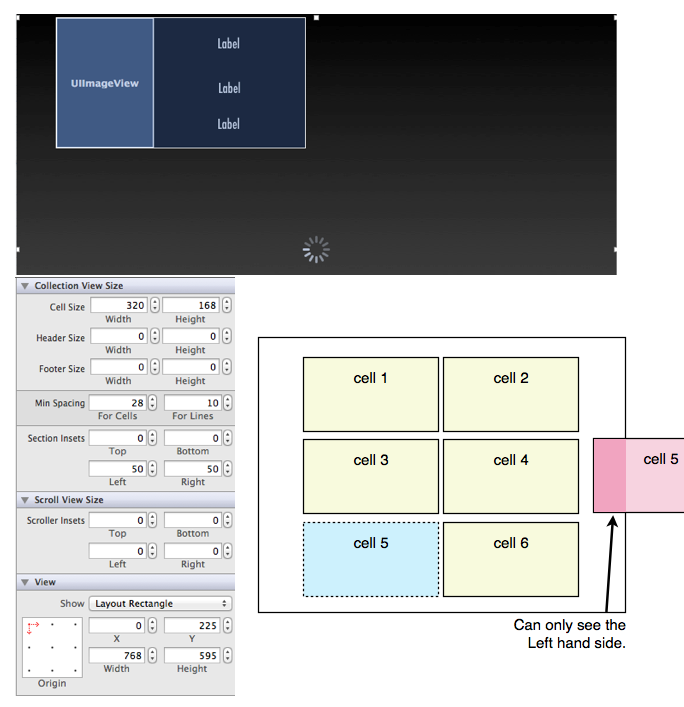 Try not to set estimatedItemSize in collectionViewFlowLayout; set itemSize directly. I have added a bug report to Apple. What works for me is to set bottom sectionInset to a value less than top inset. Subclass UICollectionViewFlowLayout and override shouldInvalidateLayoutForBoundsChange to return YES. This only partly solves the problem I'm having with this issue. The cell does indeed go to the correct place when the row appears. However, just before it appears I still get a cell appearing off the side. Careful — doing this will cause layout to be run every time you scroll. This can severely impact performance. I was experiencing the same cell-deplacing-problem on the iPhone using a UICollectionViewFlowLayout and so I was glad finding your post. I know you are having the problem on an iPad, but I am posting this because I think it is a general issue with the UICollectionView. So here is what I found out. I ended up setting the sectionInset and headerReferenceSize depending on the screen size. I tried about 50 combinations until I found values under which the problem did not occure anymore and the layout was visually acceptable. It is very difficult to find values which work on both screen sizes. So summarizing, I just can recommend you to play around with the values, check these on different screen sizes and hope that Apple will fix this issue. I've had this problem as well for a basic gridview layout with insets for margins. The limited debugging I've done for now is implementing - (NSArray *)layoutAttributesForElementsInRect:(CGRect)rect in my UICollectionViewFlowLayout subclass and by logging what the super class implementation returns, which clearly shows the problem. By implementing - (UICollectionViewLayoutAttributes *)initialLayoutAttributesForAppearingItemAtIndexPath:(NSIndexPath *)itemIndexPath I can also see that it seems to return the wrong values for itemIndexPath.item == 30, which is factor 10 of my gridview's number of cells per line, not sure if that's relevant. With a lack of time for more debugging, the workaround I've done for now is reduced my collectionviews width with an amount equal to the left and right margin. I have a header that still needs the full width so I've set clipsToBounds = NO on my collectionview and then also removed the left and right insets on it, seems to work. For the header view to then stay in place you need to implement frame shifting and sizing in the layout methods that are tasked with returning layoutAttributes for the header view. Thanks for the extra information @monowerker. I think my problem started when I added the insets (I have added this to the question). I will try your debugging methods and see if it tell me anything. I might try your work around too.